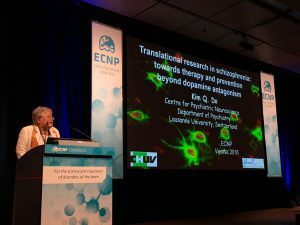 Dr Luis Alameda, clinician-scientist at the Center for Psychiatric Neuroscience, was awarded one of the research prizes 2019 of the European Psychiatric Association (EPA). The winning article in the category Biological correlates and treatments of mental disorders is entitled Redox Dysregulation as a Link between Childhood Trauma and Psychopathological and Neurocognitive Profile in Early Psychosis Patients, and was published in November 2018 in Proceedings of the National Academy of Sciences of the USA (PNAS). The study was conducted in collaboration with Dr Margot Fournier and Dr Ines Khadimallah, neurobiologists at the Center for Psychiatric Neuroscience. 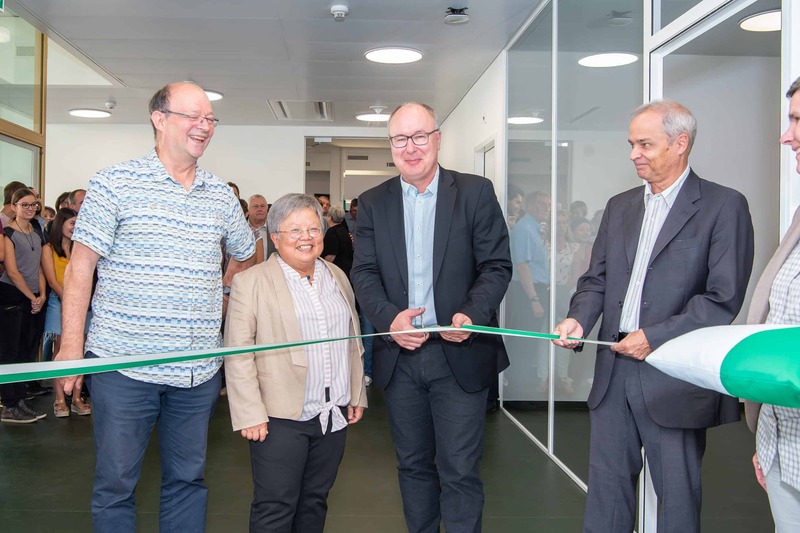 Two years after its construction was launched, the new building of the Center for Psychiatric Neuroscience (CPN, Department of Psychiatry, Lausanne University Hospital) opened its doors. The inaugural ceremony took place on September 21st, in the presence of Mr Pierre-Yves Maillard, member of the Council of State (second from the right), Mr Alain Gillièron, mayor of Prilly (far right), Prof. Jacques Gasser, head of the Department of Psychiatry (far left), Prof. Kim Do Cuénod, director of the CPN (second from the left), and the architect Mr Nicolas Vaucher. 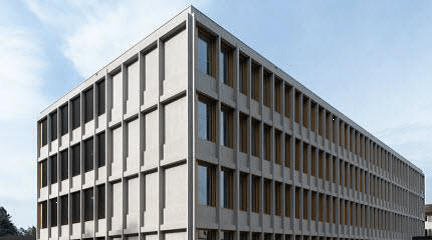 Initiated in 2016, the building hosts ten translational research units focusing on psychiatric diseases such as schizophrenia, mood disorders, drug addiction, anxiety, depression or Alzheimer’s disease. 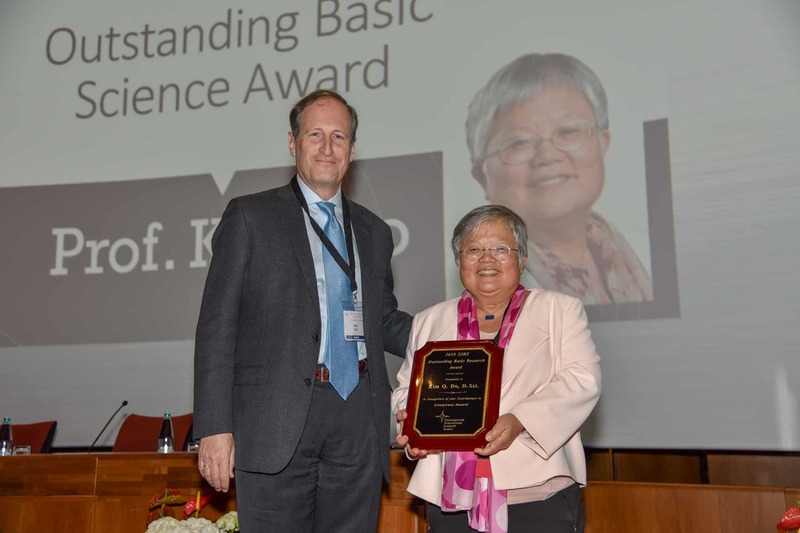 Kim Do Cuénod was named winner of the 2018 SIRS Outstanding Basic Science Award. The award is granted biennially by the Schizophrenia International Research Society in recognition of an outstanding basic research contribution to schizophrenia research. The contribution may be preclinical or work which emphasizes the interface between basic and clinical research. The selection of the award recipient is based on the quality of the contribution and its impact on advancing schizophrenia research. It is a great honor for award recipients to be held in such high consideration by their peers. The award ceremony took place during the SIRS Conference in Florence (4-8 April 2018). 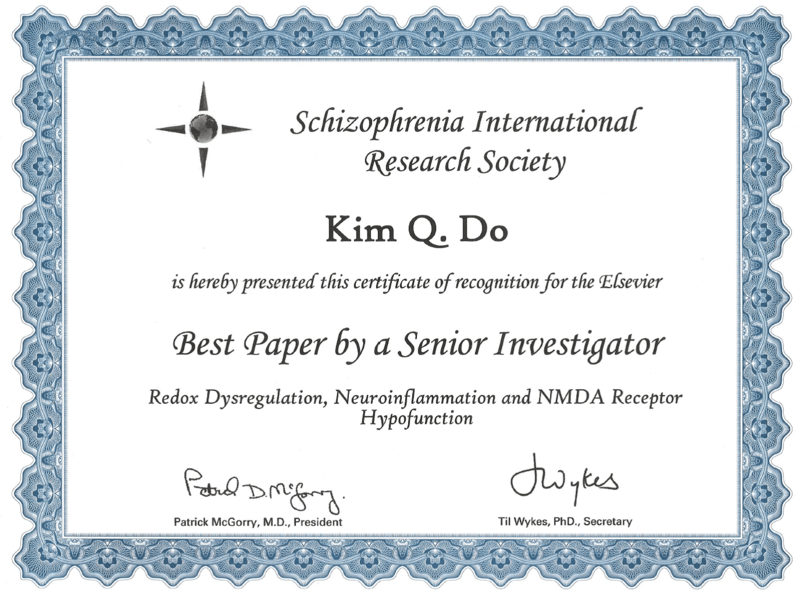 At the same Conference, Kim Do Cuénod was also presented with the 2018 Elsevier Senior Schizophrenia Research Award, which acknowledges her outstanding contributions to the field of schizophrenia research and the significant impact her article entitled “Redox dysregulation, neuroinflammation and NMDA receptor hypofunction: a “central hub” in schizophrenia pathophysiology?” generated among journal readers, based on the citations this article received during the past year. The award is granted by Elsevier, publisher of Schizophrenia Research. 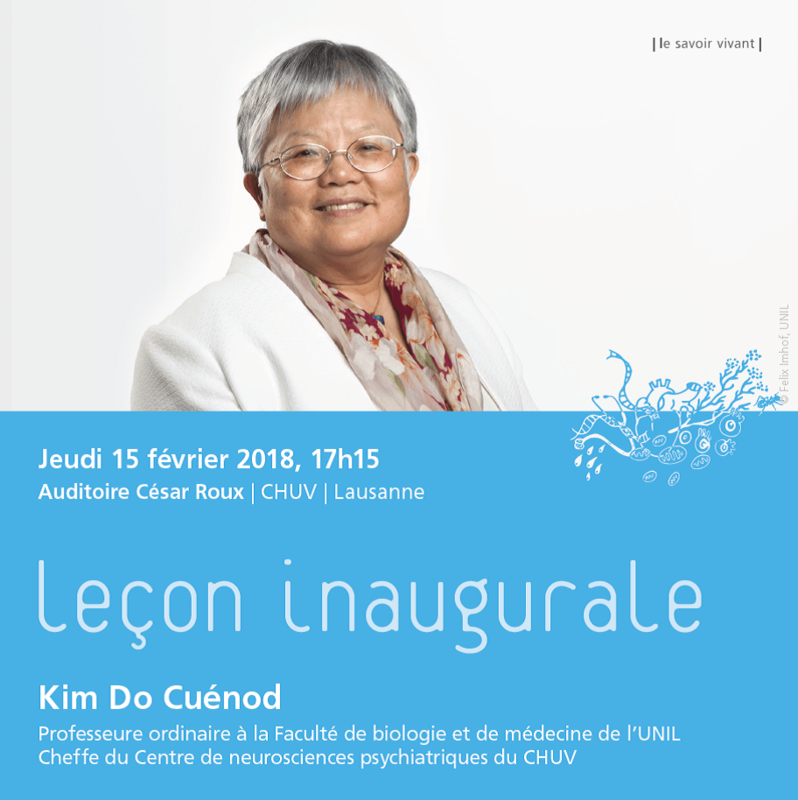 On Februray 15th, 2018, Kim Do Cuénod gave her inaugural lesson as Ordinary Professor of the Faculty of biology and medicine of the University of Lausanne. On January 18th, 2018, the Alamaya Foundation organized a guided tour of the exhibition Ai Weiwei – D’ailleurs c’est toujours les autres at the Musée Cantonal des Beaux-Arts in Lausanne. Around fifty friends and donors of the Foundation participated in the visit, which was expertly commented by Mr Camille Lévêque-Claudet, curator of the Museum. Ai Weiwei is one of the most important and influential artists of the last ten years. 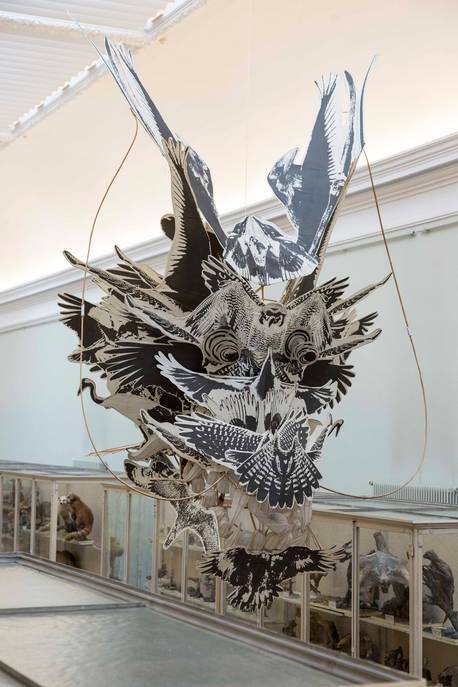 The exhibition included over forty of his creations illustrating the wealth of Ai Weiwei’s work and his deep knowledge of the cultural tradition of his country. It was an opportunity to discover an allround genius: remarkable visual artist, encyclopedic mind, exceptional communicator, and a man committed to the great issues at stake in our world. The Unit for Research in Schizophrenia (Prof. Kim Do Cuénod) and the Service of General Psychiatry (Prof. Philippe Conus) of Lausanne University Hospital, in collaboration with the Harvard Medical School in Boston (Prof. Larry Seidman), conducted a clinical trial with N-acetyl-cysteine (NAC) in patients with a first psychotic episode. Their pioneering results have been published in the journal Schizophrenia Bulletin. 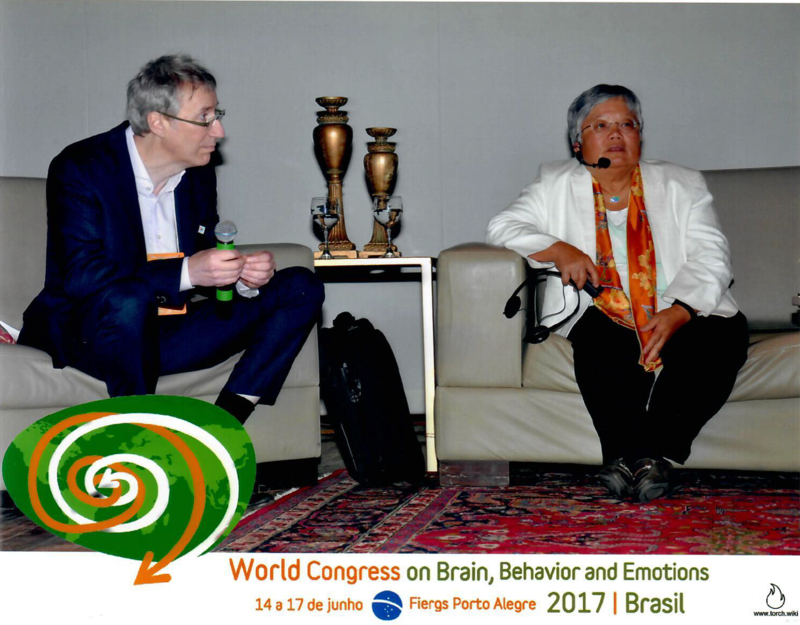 In mid-June 2017, Kim Do Cuénod gave a plenary conference at the World Congress on Brain, Behavior and Emotions, which took place in Porto Alegre, Brazil. She also participated in a forum during this event. The congress attracted around 5’000 participants, of whom 1’000 have been able to attend Prof. Do Cuénod’s plenary conference. At the invitation of Prof. Alain Prochiantz, director of the Collège de France in Paris, Kim Do Cuénod participated in a colloquium, which was held at this prestigious institution on May 4th and 5th, 2017. See program of the colloquium. Kim Do Cuénod chaired a symposium at the 2017 edition of the International Congress on Schizophrenia Research , which took place from March 24th to 28th in San Diego, California (USA). The symposium was entitled “Inflammation and redox dysregulation in the developing brain and schizophrenia”. On January 18th, 2017, the friends and donors of the Alamaya Foundation were invited to visit the exhibition entitled August Strindberg. From the sea to the cosmos, which took place at the Musée cantonal des Beaux-Arts in Lausanne. Mr Camille Lévêque-Claudet, curator of the Museum and organizer of the exhibition, offered to coordinate the visit. August Strindberg (1849-1912), internationally renowned writer and dramatist, and author of the famous plays “The Father” and “Miss Julie”, is also one of the greatest Swedish visual artists. He was a man of intense sensitivity, and suffered from psychological disorders. The exhibition was one of the rare occasions to see a collection of his major masterpieces. Dr Luis Alameda, clinician-scientist at the Unit for Research in Schiziphrenia (URS, Center for Psychiatric Neuroscience, Department of Psychiatry, Lausanne University Hospital) received an Award of the Faculty of Biology and Medicine of Lausanne University for his thesis in medicine entitled “Childhood sexual and physical abuse : age at exposure modulates impact on functional outcome in early psychosis patients” and published in Psychological Medicine. His study highligths the greater risk to be affected by psychosis in children who have been physically or sexually abused – and shows that the age of exposure to abuse influences the subsequent evolution of the illness. 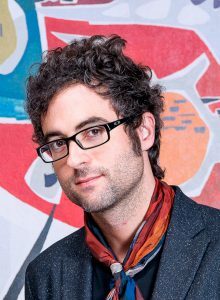 Following this publication and his award, Luis Alameda was invited to give an interview on Swiss Radio. To listen to the interview, click here. Kim Do Cuénod has been invited to give a plenary lecture at the 29th ECNP Congress (European College of Neuropsychopharmacology), which took place from 17 to 20 September in Vienna (Austria); such an invitation vouches for the international visibility and prestige of the research programme conducted by Kim Do Cuénod. Her lecture was scheduled on September 19th, and attracted an audience of over 1,000 scientists. In Vivo, the magazine published by Lausanne University Hospital, features an article on the collaboration between neuroscientists and psychiatrists, and progress achieved in the field of research in schizophrenia. In Vivo, the magazine published by Lausanne University Hospital, features an article on Dr Jan-Harry Cabungcal, senior researcher at the Unit for Research in Schizophrenia (URS, Center for Psychiatric Neuroscience, Department of Psychiatry, Lausanne University Hospital). To watch the program, click here. Corroborating the excellence of the studies conducted at the Unit for Research in Schizophrenia (URS, Center for Psychiatric Neuroscience, Department of Psychiatry, Lausanne University Hospital), two members of the group have been rewarded for their projects. Dr Jan-Harry Cabungcal received the Young Investigator Award 2015 of the Swiss Society of Biological Psychiatry for his article entitled Juvenile Antioxidant Treatment Prevents Adult Deficits in a Developmental Model of Schizophrenia, published in Neuron, a highly renowned scientific journal. He showed that the anomalies of specific neurons essential for cognitive activities can be avoided or corrected with the antioxidant N-acetyl-cystein. This discovery paves the way for new treatments. Dr Aline Monin received an Award of the Faculty of Biology and Medicine of Lausanne University for her thesis entitled Redox dysregulation in schizophrenia: implication for oligodendrocyte maturation and structural connectivity, published in the high impact journal Molecular Psychiatry. 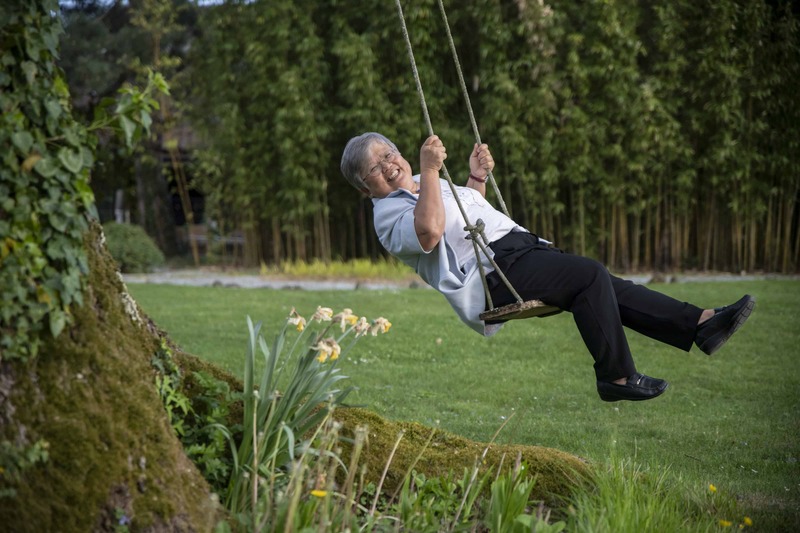 She explained the mechanisms responsible for anomalies of the nervous fibres, which connect the various brain areas. These anomalies are observed in people suffering from schizophrenia. 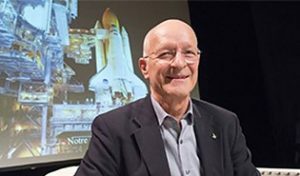 Virtual Event Neuroscience – Kim Do Cuénod was invited to give a “virtual” conference during a “webinar” organized by LabRoots, a leading scientific social networking website based in California. Kim Do Cuénod was invited to give a special lecture at Neuroscience 2014 in Washington DC (USA), the annual meeting of the Society for Neuroscience and most important congress worldwide in the field of neuroscience, which gathers over 30’000 participants each year.